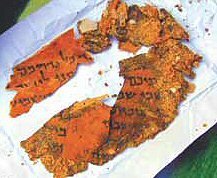 The Sacred Page: Dead Sea Scroll Discovery: New Fragment Found! Once again, the Dead Sea area has yielded a significant discovery. After all this time and all the searching you'd think the well would have dried up. Not so. Israel Today is reporting that two fragments made of animal skins containing the text of Levitucs 23:38-39 and 23:34-44 were placed in the hands of the Israel Antiquities Authority. The text was written in ancient Hebrew and dates to the period of the Bar-Kochba revolt of the second century A.D. Like many of the scrolls found, the story of the discovery itself is fascinating. About a year ago, Professor Chanan Eshel, an archaeologist at Bar Ilan University in Tel Aviv, was summoned to an abandoned police station near the Dead Sea for a clandestine meeting with a Bedouin Arab. After explaining that he’d been offered $20,000 on the black market, the man asked Eshel to evaluate the fragments. It would be hard to describe the emotions that surged through the professor’s heart as he examined the skins. “I was jealous that he had found them instead of me,” said Eshel, who has worked in the Judean Desert for nearly 20 years. “I was also very excited, though I didn’t believe I would ever see them again.” Months later, after learning that the fragments had not left the country, Eshel bought them with $3,000 provided by Bar Ilan. The skins were turned over to the IAA, which is now testing them for authenticity. They are the 15th find in this area and date to the Second Revolt against the Romans under Bar-Kochba. Such a find makes it hard to imagine that there aren't still undiscovered fragments out there. - I know a lot of people who are holding out for that discovery of "Q". - B. H. Streeter could have used a finding of "M"
- A number of scholars would like to see a copy of Hebrews signed "by Priscilla"
- J. Massyngberde Ford held out for a copy of the Apocalypse signed "by John the Baptist"
What a Theology nerd I've become...I actually get some of those jokes! 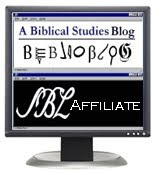 The discovery of the Leviticus fragments is old news- discussed by the bibliobloggers months ago. I don't know why Israel Insider decided to re run the announcement.